The projection/price update is available now. Click here to download the XLSX file. The password to open the file is the last name of the pitcher in the upper left hand corner of page 120 in the Guide. The password to modify the file is the last name of the hitter in the upper left hand corner of page 50 in the Guide. Both passwords are lower case. Do not capitalize the last name. 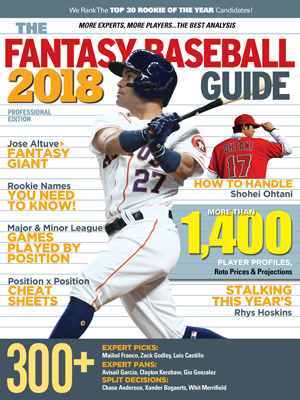 This is the place you’ll find corrections to errors that were made in the Fantasy Baseball Guide 2018. We try to be perfect, but have so far failed to pull that off. In recent years we’ve been getting better, which is nice, but what we can do is acknowledge our mistakes and offer a place for you to double check our work. If you find a mistake that hasn’t been corrected here please write to askrotoman@gmail.com and let us know. UPDATE: This year’s model did continue our path of improvement. The following is an inventory of the screw ups. David Robertson does not equal 28 saves. The projections in the Guide are mostly mechanical. They use past history with some modifiers. The formula picked up Robertson’s history of saves, which is unlikely to continue this year because of the Yankees bullpen. I go through the projections in an attempt to fix things like that by hand, and I did fix many of them. I missed that one. The formula I used for calculating 2018 pitcher projections for Win and Losses was wrong. It was a small mistake, a lexicographical one that pointed to one cell down from the one it should have in my projections spreadsheet, but it means that all pitching projections for Win and Losses in the Guide are wrong. UPDATE: Not all were wrong. I do a lot of jiggering the projections for players without much major league experience, or a change in roles. Those are correct in the magazine. Alas, for a fair number of marquee pitchers, the W-L records were clearly wrong. When I spot checked the projections in the final layout I missed those. Here are the “correct” won loss records for pitchers in spreadsheet form. These are the numbers that should have been in the Guide. Ed. Note: A few days ago I posted a spreadsheet that didn’t fix the problem. Somehow the gremlin reappeared. And, I discovered earlier today (19th) that the updated fix broke the jiggering for the players whose projections had been adjusted by hand. This sheet, updated at noon on the 19th, has the correct results of the formula. I’ll be going through and fine tuning it today to make sure there’s nothing untoward. Thank you for your patience. As I look at these there are still a lot of oddities. W-L records are very fickle, especially when pitchers have variation in innings pitched from year to year. My formulas for the Guide projections basically take the last three years and project them to this year’s IP. So please, don’t count on these if you don’t have to. 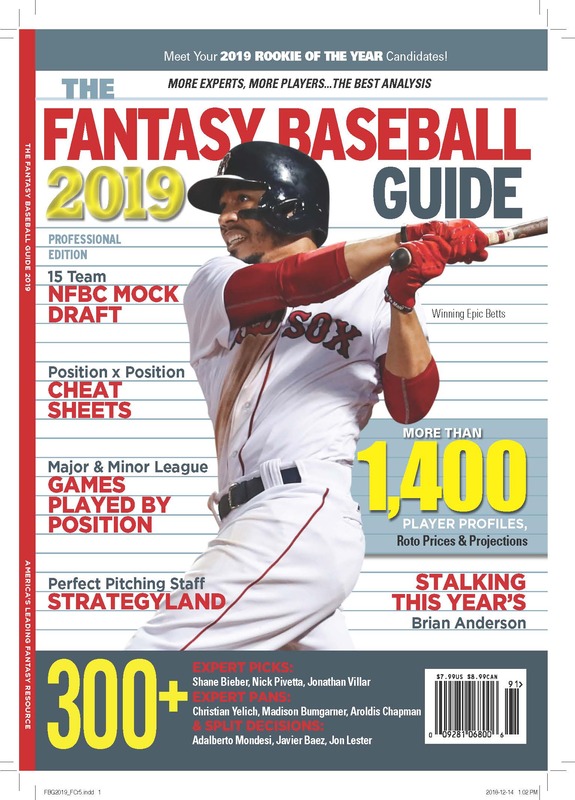 We usually publish updated prices and projections for owners of the Guide on March 15th, which will include a lot of updated and massaged numbers. This year we’ll publish an earlier update, on about February 15 in the first weekend in March (because none of the big free agents had signed by mid February not much had changed. I’m very sorry for the problem. If you would like hear more about how this mistake was made, please write me at askrotoman@gmail.com. I’m very glad to fix things as best I can, and am happy to explain how things went wrong. To decide who is a Starter and Reliever in the draft at a glance section I make a few assumptions. Those over 125 innings are starting pitchers. But those with fewer can go either way, so I go through the list by hand. Usually this is easy, but for some reason this year I classified Luis Castillo, who made 15 fine starts for the Reds last year (and 14 in Triple-A), a reliever. Castillo has five PICKS in the Guide, and this was one dumb error. Castillo is not the 20th best reliever this year, he’s the 60th best starter. The lists have been corrected in the online version. The Fast Facts in the Reliever section are the Fast Facts that should be in the Starter section. And vice versa. In the Pitching A-Z pages, a coding glitch caused every Mike Podhorzer comment to be repeated, credited to JD Bolick as well. The fix is to ignore the Bolick comments, and think of Mike. I’m fixing the coding, so next year we get it right. I don’t know how this happened, but there is an errant entry for a bogus person by the name of Tyler Motter, following directly after the mostly correct entry for Taylor Motter, who is a real person. Curiously, the Earnings line in the Tyler Motter entry is correct, the Taylor Motter Earnings line is not. And the Tyler profile was written for Taylor, as was the Taylor profile. The Tyler pick by Dave Adler was actually written for Roughned Odor, and is included in his profile.